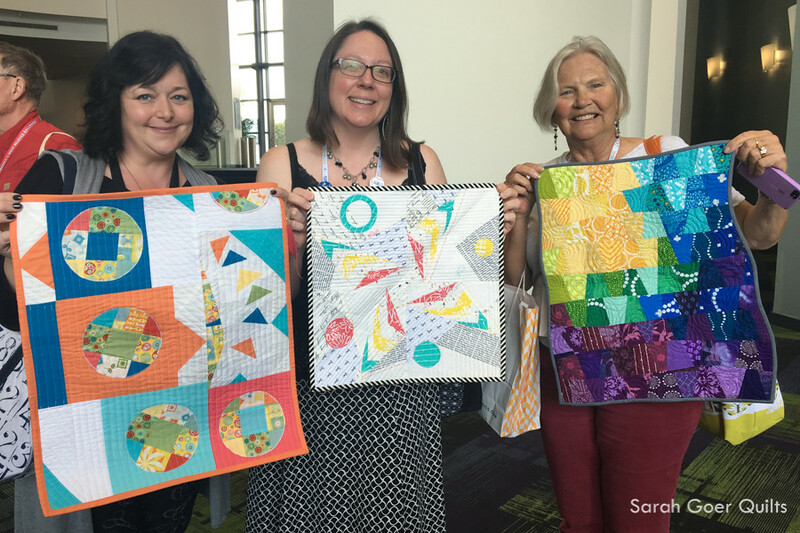 I couldn't resist the appeal of the mini swap with The Modern Quilt Guild in which we would exchange our mini quilts at QuiltCon. I was assigned Ginger as my secret partner and found inspiration in her Pinterest account. 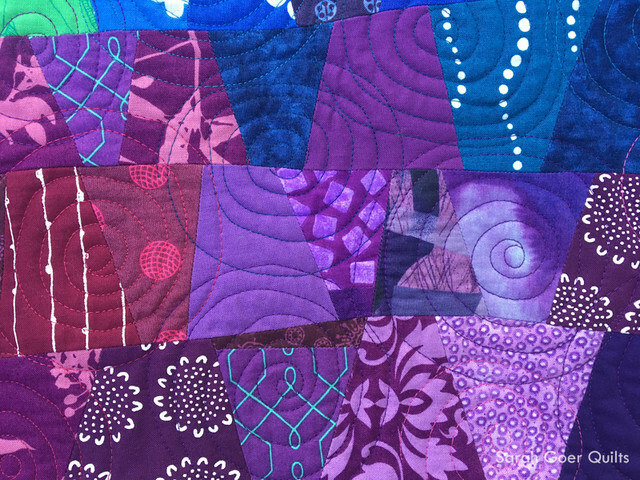 Specifically, I was drawn to the colors in this pin and loved the color wash design and spiral quilting in this one. I'm not sure how I came up with the idea to make improv tumbler blocks. It mostly started as an exercise in figuring out if I could achieve it. 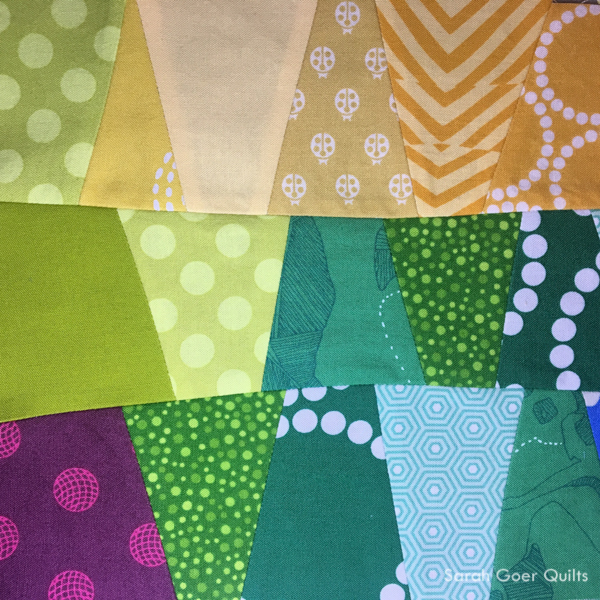 I started by cutting three tumblers from each fabric as I worked through scraps and stash choosing fabrics. I aimed for about 3" tall using my cutting matt as a guide, but all of my cutting was done with a rotary cutter and no ruler. I wanted a variety of tumbler shapes, but aimed for generally 1 1/2 - 2" wide on the narrower edge and 3 - 3 1/2" wide on the wider edge. Once I'd cut a bunch of tumblers, I started fiddling with layout on my design wall and ended up with this plan. 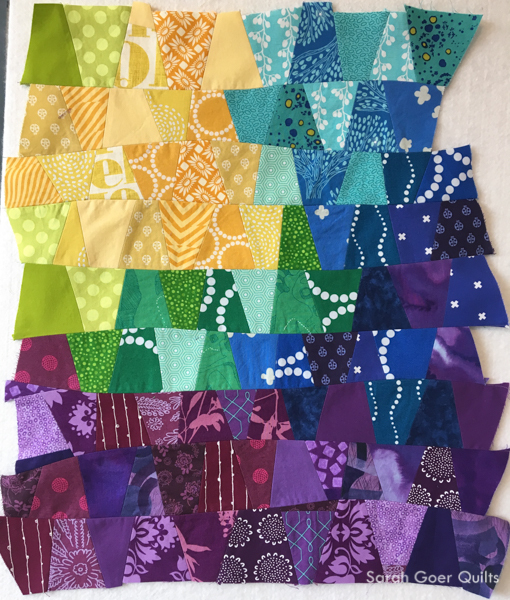 The easiest part of the piecing was connecting the tumblers in each row. 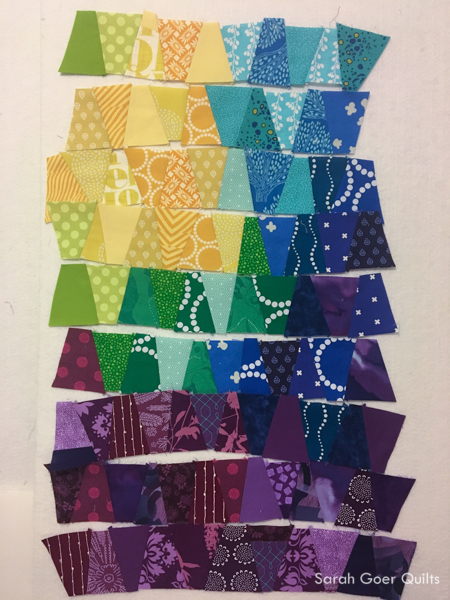 The first row I pieced (the bottom row) came out to be pretty curved (which I adjusted a bit by picking out one seam), so from then on I worked to compensate for that a bit as I pieced. It's fun to watch the project shrink up as the piecing happens. 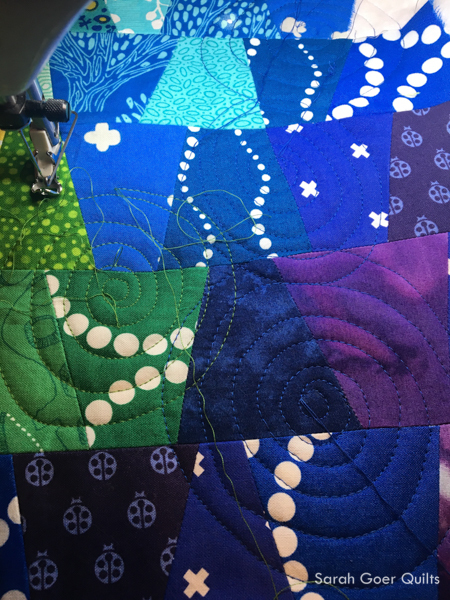 Once my rows were complete, I decided to use smooth curves to connect the rows. So what's a girl to do when she's up against a deadline and also needs to pack for QuiltCon? 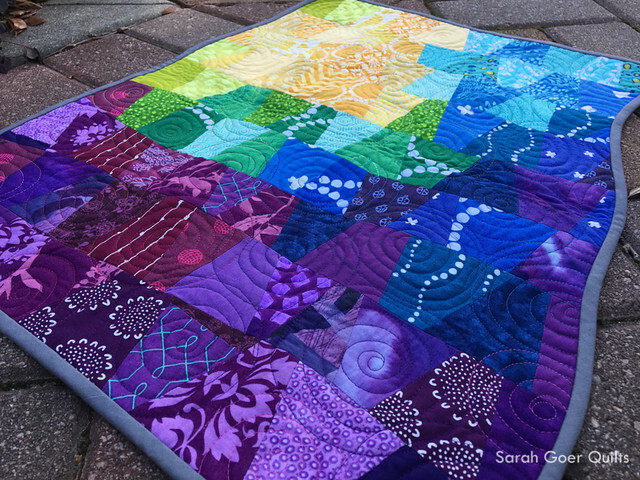 Well, naturally, she should decide to use thirteen thread colors and dozens of starts and stops to quilt her mini! Right? That's totally a sound decision, eh? 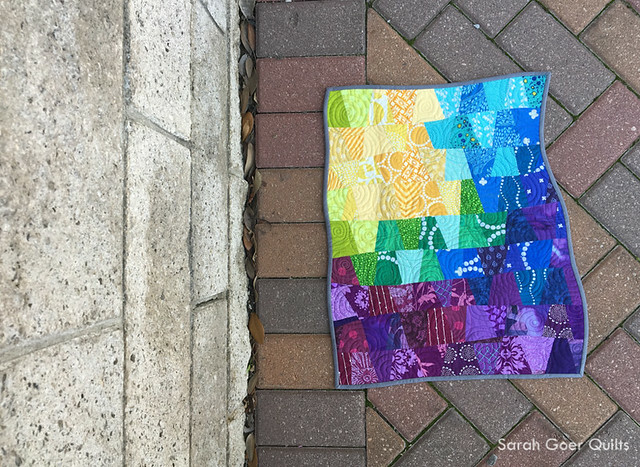 I pulled all my Aurifil (50 wt.) 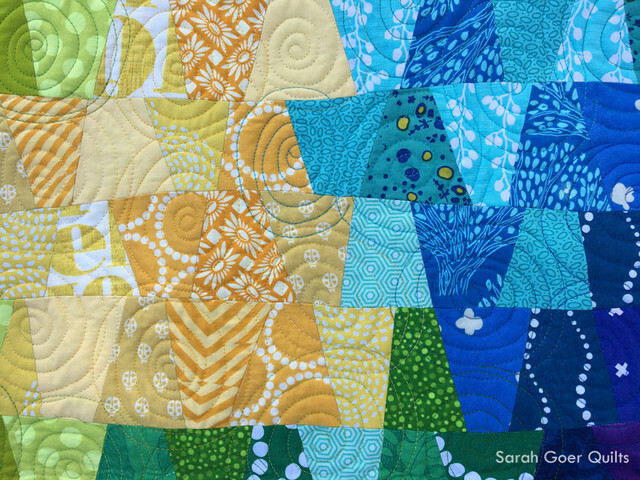 that was even close to a color used in the quilt. From left to right they are #2735 Medium Blue, #5018 Grass Green, #1125 Medium Teal, #2783 Medium Delft Blue, #1231 Spring Green, #2135 Yellow, #3920 Golden Glow - Variegated, #1114 Grass Green, #2810 Turquoise, #4093 Jade, #2582 Dark Violet, #1100 Red Plum, and #2588 Light Magenta. Plus I attached the binding with #2605 Grey. If I stashed different weights of thread, I totally would have thrown them in too! Then I stitched overlapping spirals that were approximately 3" in diameter. 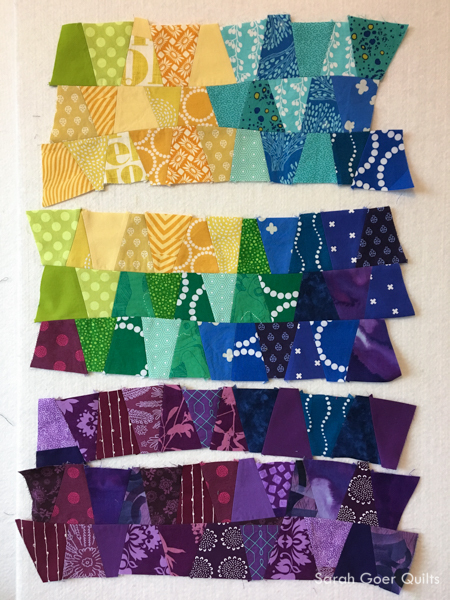 I mostly aimed to match the thread color to the area of the fabric that I was quilting on, but of course there were some great spots where strong contrast occurred as well. Here's where I started. I went to Savannah with zero threads tied and buried and my binding was only attached to the front of my quilt. I worked on burying threads on Thursday and Friday while watching demos and sitting near outlets to charge my phone. I got to give a handful of one-on-one demos myself on how to bury threads. ;-) Friday evening after dinner, I finished the final stitching on the binding. Once a procrastinator, always a procrastinator? I like that my late night hotel photo shows the texture of the quilting so well. And of course, I took the quilt out for a mini photo shoot before delivering it to Ginger. Here are Susan, myself and Ginger. We were connected in a little loop for the swap. Susan made for me, I made for Ginger, and Ginger made for Susan. We're each holding the quilt we received. I love the beautiful mini I received from Susan. It has some lovely embroidery detail that you can't see in the picture. And I adore the striped binding! Thanks for visiting! I'm officially on an IG swap break for the time being... but boy are they fun! Posted in Quilting. 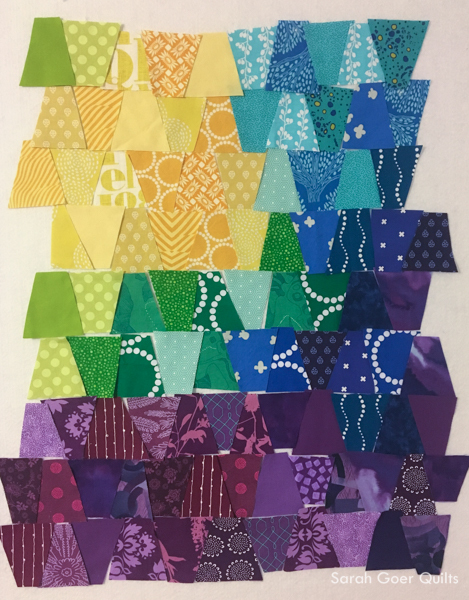 Tags: color wash, finished quilt, free motion quilting, improv piecing, mini quilt, MQG Swap, quilt swap on February 26, 2017 by sarah. 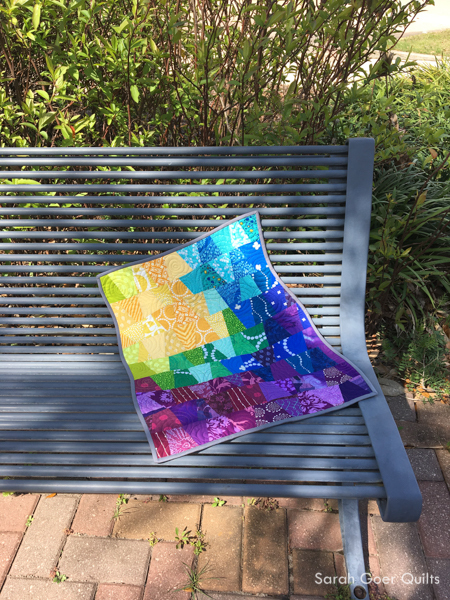 The mini turned out so beautifully; choosing to work with all those thread colors for quilting was a bit crazy but as you said the texture it added was so worth it! How fun to be in a small loop for the trade - everyone looks so pleased with what they received. Sometimes you've just gotta go with the crazy option. Thanks, Yvonne! A gorgeous mini! 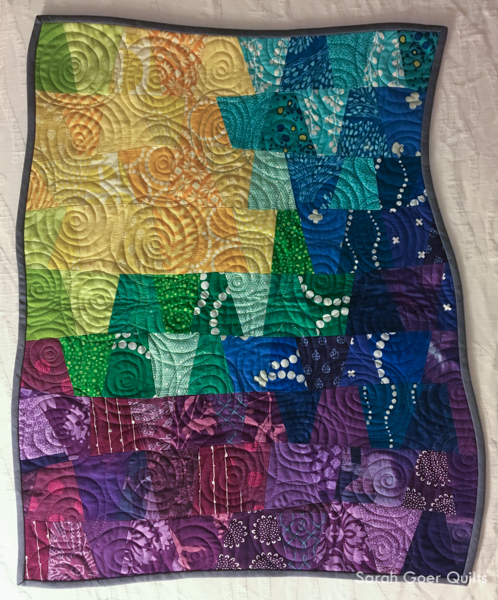 Beautiful curved piecing and quilting! Thank you for participating in the FAL, on behalf of the 2017 global FAL hosts. Thank you, Lucy. I'm starting to fall in love with improv curves.